At The Fleur De Lis, enjoy a satisfying meal at the restaurant. Quench your thirst with your favorite drink at the bar/lounge. A complimentary English breakfast is served daily from 7 AM to 9 AM. Make yourself at home in one of the 3 guestrooms. Complimentary wireless Internet access is available to keep you connected. Bathrooms have complimentary toiletries and hair dryers. Housekeeping is provided daily, and irons/ironing boards can be requested. 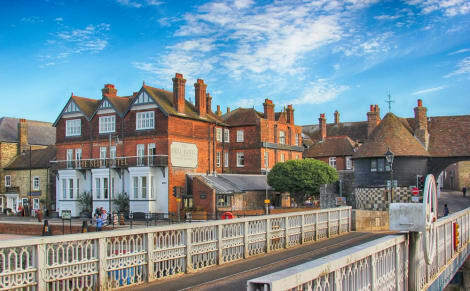 This charismatic Kent town is known for its fine selection of medieval landmarks and was once an important maritime centre, despite now being well inland from the North Sea. The settlement overlooks Sandwich Bay, which includes a Site of Special Scientific Interest and a very important nature reserve. Sandwich is home to the Guildhall Museum, where you can discover the history of the area during the Roman period and the Middle Ages, and observe a remarkably well preserved ancient court room. The town is also the site of the Norman and Gothic-style St Mary's Church, which, despite being redundant, is a Grade I listed structure and was extensively refurbished in the Victorian period. Another place worth visiting in Sandwich is the White Mill, which is more than 250 years old and is now a popular heritage centre. One of the great symbols of the Garden County, the Secret Gardens of Sandwich are surrounded by Sandwich's historic stone walls and overlooked by a majestic manor house that is also Grade I listed. The gardens have benefited from a comprehensive restoration in recent years, and contain a charming Edwardian-themed Tea Room where you can enjoy the finest teas and plenty of fresh snacks. If you're after some divine Italian flavours and freshly made Pizzas and pasta dishes, you can dine at Luigi's restaurant, or head to the George & Dragon pub for other delightful cuisine. The Hop and Huffkin restaurant, meanwhile offers other mouthwatering British dishes, while the Thai Time restaurant is the place to be if you're after some wonderful Southeast Asian flavours. Stay at the authentic Molland Manor House for an authentic country inn experience, or book a room at The Lodge at Princes Golf Club, one of the most elegant Sandwich hotels. Other great choices include the friendly St Peter's Bed and Breakfast, The Bell Hotel, and the Goss Hall Bed & Breakfast.